Subsea cable and connector specialist Hydro Group, alongside its French regional partner Wenex Equipments, has successfully completed its scope of work on the SEM-REV marine renewable energy project in only seven months. In 2015, the Franco-Scottish consortium won a £2.5 million (3.5 million euros) contract to manufacture and install the array cabling infrastructure, 12 miles from the town of Le Croisic on the French Atlantic coast. The Floatgen turbine is now fully operational. Its connection to the grid will enable the supply of electricity to 5,000 inhabitants. The contract, led by Entreprise Travaux Publics de l’Ouest (ETPO) with the assistance of Hydro Group Plc and Wenex Equipements as sub-contractors, is already being acknowledged as the successful foundation of the French industrial offshore wind energy sector. Benoit d'Alançon, Director General of Wenex Equipements SA, added that the successful completion of the SEM-REV project is of great importance to the Franco-Scottish collaboration and that by working together, the two concerns have demonstrated the effectiveness of their technical partnership and created a solid foundation for future success. The turbine is the first operational unit of the floating foundation concept patented by Ideol, built in concrete by Bouygues Travaux Publics. 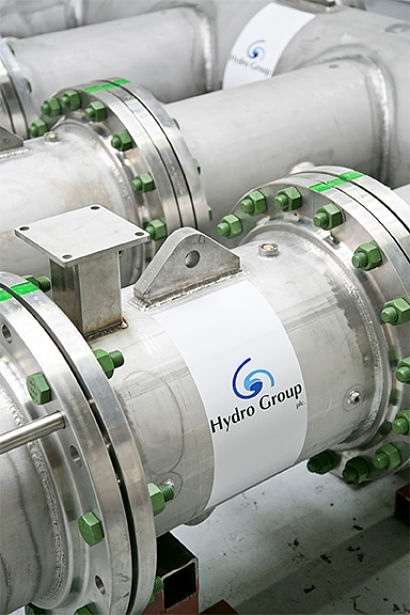 From its state-of-the-art manufacturing facilities in Scotland, Hydro Group develops the complete subsea electrical and optical interconnect package, built to withstand the harshest environmental conditions. The company employs more than 100 full time staff worldwide and provides total solutions to a portfolio of prime contractors, major operators, OEMs, defence agencies, defence organisations and the UK MOD.